These sarcastic words are among his last, as shortly afterwards he himself is killed by a frenzied Hector. Even in the heat of the battle, Homer allows his hero to paint an enticing and almost idyllic picture of a man who gladly jumps into the depths of a rough sea to fetch an armful of oysters for his shipmates to enjoy. In this context, Homer chooses the more archaic form τήθεα (téthea), instead of the more common ὄστρεα/ostrea (or ὄστρεια/ostreia). But more on this etymology will be written later. This seems to be the earliest mention of oysters in Greek literature. However, regarding their culinary attributes, there are a few passages in later literature, which provide certain insights into their appreciation. For instance, oysters appear in fragments of extracts of a Greek poet, Matron (Μάτρων), often known by his latinised form as Matro, who originated from a coastal town in Asia Minor or Western Turkey, Pitane, about 80 kilometres north of the now modern city of Izmir, and lived in Athens towards the end of the 4th century BCE. He won himself a reputation for his parodies of dinner parties or banquets, one of which is now known as the Attic Dinner-Party (τὸ Ἀττικὸν Δεῖπνον [To Attikon Deipnon]), that were common among the rich and famous during this period in Athens. A couple of longer fragments was saved for posterity by a later poet, Athenaios of Naukratis (a Greek colony in the Nile delta of Egypt), who lived roughly five centuries later, and who compiled a large collection of texts about food, cookery and banquets, later known under the title of Deipnosophistai. This genre of gastronomical poetry, a form of parody, came into fashion during the 5th century BCE in Athens as a means of entertaining a mass audience, in which the satirical use of epic poetry, especially the pretentious phrasing and epithets of Homeric epics, helped to conjure up laughter and derision about the burlesque character of these feasts. The parodies would have probably been performed at public gatherings, rather like the stand-up comedians of today, though the poetry recited was rigorously, if not scornfully, delivered in the Homeric hexameter form. The poems portrayed the gluttony and bizarre tastes that the few could afford, whilst at the same time giving the hoi polloi a chance to voice their jealousy and envy of the privileged and political classes. According to Matron, one of the very first dishes served at these feasts featured oysters, obviously regarded even then as appetisers. Matron described how the cooks began by loading up the tables with vegetables and shellfish, picking out particularly asparagus and oysters which he called ‘marrowy’ (ὄστρεα μυελóεντα/ ostrea myeloenta), in the sense of bone marrow, rather than the vegetable marrow, thus emphasising their loose softness, although bone marrow was itself considered a specialty. However, another interpretion offered is that this was a pun on the marrowy bones (όστéα μυελóεντα/ ostea myeloenta) so lovingly cherished by the Cyclop monsters, mentioned in Homer’s Odyssey. In their commentary on the text, Olson and Sens² mention (p.87) that this adjective is a Homeric hapax legomenon, signifying that its occurrence was quite unique and highly specific. Apparently, besides its cameo appearance in this culinary context, the adjective μυέλινος (myelinos) has also been used to convey the softness of a young man’s buttocks! Possibly another delicacy for the Greeks but hardly something to dwell on, next time we dig into a platter of oysters! In another of Matron’s fragments, a single one-liner hexameter, a cook ‘also brought oysters, truffles of the Nereid Thetis’ (ὄστρεά τ’ἤνεικεν, Θέτιδος Νηρηίδος ὕδνα/ ostrea t’eneiken, Thetidos Nereidos hydna). In their commentary to Matron’s fragments, Olson and Sens suggest (p.144-145) that the implication here is that truffles (tuber cibarium) are hidden like oysters, from immediate view: truffles are concealed in the ground whilst oysters are buried on the sea bed, although it must also be admitted that given the fact that these dark-coloured truffles understandably were a very rare delicacy, their association with oysters may reveal something of the culinary status of oysters as well. 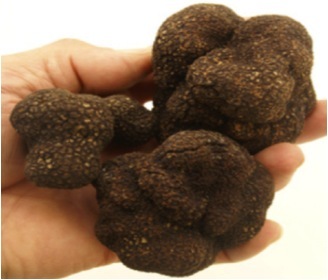 In fact, the authors do refer to another Greek source where truffles were compared to delicacies of the sea. But they also mention the possibility of a play on words in which case the word may also infer the sense of ‘being raised in the sea’. However, the mention of the ancient deities of Nereus and especially Thetis, who was one of the many daughters of the old sea god Nereus, one of the so-called Nereids, and whose home was the Aegean Sea, seems to convey a primeval sense or quality belonging to oysters. This can be further inferred by the more than etymological link between Thetis and the more archaic sea deity Tethys (Τηθύς), daughter of the primoridal sky-god, Ouranos, and earth-goddess, Gaia, and from which stems an even older word in Greek for oyster (τῆθος/ tethos). On the other hand, another possible interpretation is that Matron was only making use of the device of hyperbole for purely poetic effect or even as some parodic innuendo that his listeners would have understood far better than we can today. Even if it is somewhat difficult to gauge just how much oysters were liked, excavations from many famous sites like Mycene, Troy and others around the Mediterannean have uncovered large mounds of discarded oyster-shells, inferring that they were consumed on a pretty much regular basis. No written source exists to prove this, but there are isolated mentions of the enjoyment of oysters. From among those fragments that are known to us, it is possible to glean information about the way oysters, for example, were prepared, how they tasted and which ones were particularly appreciated. They were known for be hard to open and it seems that they were often boiled or baked on a wood fire, if not consumed raw. Also there are occasional indications that there existed a level of aquaculture beyond the simple subsistence farming or fishing, often by diving with baskets, which in turn initiated a certain commercial trade around the Mediterranean Sea. Again Athenaios: in his work, he quotes a physician from Sifneos, Diphilos, who lived during the early 3rd century BCE. He describes how oysters live in rivers, lagoons and the sea, of which it is the latter that have the best taste, especially if there is a lagoon or river nearby, because oysters seem to grow more in brackish water. They are then bigger, more juicy and sweeter. At the beginning of summer they are at their best, because they are plump and their saltiness is tinged with a certain sweetness. His conclusion is that oysters are wholesome (εὐστόμαχα/evstomacha) and easily digestible or secreted (εὐέκκριτα/evekkrita). These observations have even today a contemporary and familiar ring about them as many an expert would agree with him. Not only was he pointing out which and why certain oysters tasted better but also the healthy benefits of eating them so that it seems more than likely that Greeks in this time were only too aware of the various tastes and effects of oysters. Athenaios also mentions another physician, Mnesitheos, who seemed to have lived in Athens in the 4th century BCE, and had certain ideas about the harmful side-effects of the saltiness of the juice of the oyster on the bowels. He recommended roasting oysters instead to get rid of their moisture which he thought had such a strong effect on relaxing the bowels, i.e. causing diarrhoea. Again the health aspects of consuming oysters are more accentuated, whilst the various ways of preparing oysters mentioned still manage to impart culinary insights as to their enjoyment. Another source that Athenaios cites is Archestratos, a poet from Gela in Sicily, whom he calls the “Daedalus of tasty dishes”, He wrote a humorous book sometime around 330BCE about the pleasures of eating and living called Hedypatheia (Life of Luxury), and where to find the best food. The best oysters were strangely to be found far away in Abydos and Chalkedon, both on the northern shores of Asia Minor (Turkey). Obviously, it is difficult to find out if this was an actual or generally accepted fact or popular lore, an ironic remark, a point of snobbery, some marketing ploy or something else, but at least, there seems to have been opinions and ideas held about what taste and health benefits oysters could provide, besides them being more than mere fodder. A later source who lived in the 1st century and wrote in Greek, another physician from Aphrodisias, again in Asia Minor (Turkey) was Xenocrates. Fragments of his work were preserved by a later Roman doctor, Oribasius 4, and there he mentioned that oysters from the high seas were not only rare but also useless due to the lack of sun that could penetrate the depths. They were too bitter, inedible and caused stomach upsets. The oyster itself preferred areas where the sea was mixed with fresh water which helped its flesh grow and which gave it a sweeter flavour. The best ones were found in the Nile delta. In Ephesus, in the mouth of the river Cayster, oysters were put into ponds (καταβόλοι/kataboloi) as seed where they increased in size. During the spring they became fuller, and fattened with a whitish, milk-warm fluid. Then he mentions a few other places along the Mediterranean coast, such as Tarragona (Spain), Narbonne (France), Puzzuoli, Brindisi (Italy), Aktion, Lefkada (Greece) and the Libyan Gulf where this practice seemed to have taken place. However, this is not absolutely clear from the context. For further information, beyond the realm of the kitchen and dining room, we need to turn to another more recognisable witness, and who else than Aristotle, the zoologist, who having been thwarted in his attempt to succeed Plato as head of his Academy in Athens travelled back to the land of his orphaned adolescence, Mysia, now part of modern-day Turkey, where he met up with his younger colleague Theophrastus and stayed on the island of Lesvos studying all manner of animals, insects and marine life. His terminology has caused a few headaches for translators, leading to some confusions, so that, for instance, the word ὄστρεα (ostrea), meaning oysters, can in certain contexts be read as the more generic shellfish. It is quite clear from his writings that he spent some time together with local fishermen along the island’s Kalloni bay, some of whom obviously told him of their observations of oysters. He heard how fishermen from the neighbouring island of Chios would move oysters from Pyrrha, a settlement on the eastern shore of the bay, to a narrow strait where several currents met, possibly between the island and the mainland. The oysters grew much faster and to a greater size but did not breed (GA, III, 763b). This would seem to suggest that an early form of aquaculture existed even in this time, as it is now an accepted fact that juvenile oysters enjoy an environment with strong currents which stimulate their growth. In most contexst, Aristotle uses the phrase, “the so-called lagoon oysters” (τὰ καλούμενα λιμνόστρεα/ta kaloumena limnostrea), which could be found just there in the shallow waters and marshland of the Kalloni bay, a term that would have been used by the fishermen of the area. He also adds that oysters attached themselves onto ceramic objects, something that had been observed by seamen off the coast of Rhodes further south. However, he writes that oysters generally stick on different surfaces, thereby becoming completely immobile. They also acquired solid shells with thick edges (HA, IV, 528a). Aristotle thought oysters, like all shellfish, proved the theory of spontaneous generation, as he could see no mating and was convinced they were generated out of mud, even though they could also be seen to grow in shallow water, on sand and even on rocks (HA, V, 547B). As was mentioned earlier, there has been a discussion about the meaning of certain Greek words used for shellfish and it is quite feasible that there was no strict adherence to a common usage, for obvious reasons. For example, the plural noun used by Homer, τήθεα/téthea, could be derived from the word τηθυον/téthyon, meaning “ascidia” or “sea-squirt” rather than τῆθος/têthos which is the older form for “oyster”. Again if we are to believe Athenaios, the two words for “oyster” – τῆθος and ὄστρεον do have identical meaning and he refers to a line in Aristophanes’ Lysistrata, from which he deduces “ἐπεὶ τήθεα τὰ ὄστρεα” (“then oysters are oysters”), adding a comment that there may have been a play on words, since the word for grandmother is τήθη/téthe, implying that grandmothers were oysters to heighten the comic effect (DS, III,90b). But it precisely this underlying affinity between oysters and the archaic which is fascinating. Not only have we seen how oysters were called the truffles of Thetis, one of the sea nymphs, but also the archaic word τῆθος/têthos conjures up images of the primeval sea-goddess Tethys. One can almost sense that these words projected an awareness of how oysters were regarded – as a primordial but venerable animal, even mysterious or magical maybe, far removed from Plato’s dismissive remark about those who have led a totally dissolute life end up as an oyster or another shellfish in the afterlife. As regards cultivation of oysters, it seems clear that the oysters’ behaviour was observed, such as the and correctly described but whether any formal practice of cultivation was implemented is difficult to discern in these writings. The ponds of Ephesus are mentioned in the Greek texts of Xenocrates, but this evidence is anyway from the era of the Roman empire, so they have been a “Roman” innovation. However, the fact that certain practices were followed, like the transport of oysters to more favourable growing areas, the observation that oysters preferred a mix of sea and fresh water, the later development of special ponds and that their flavour was influenced by the surface they grew on, all seems to indicate that there were attempts made at cultivating these molluscs. And finally, in the hidden treasures of the Louvre there is a frail and almost illegible papyrus on which is preserved a fragment of a six-line poem in the form of a riddle, dated to the latter part of the 3rd century BCE, although the riddle itself could be much older. It asks which animal has its home near a famous landmark, fattens in the waxing moonlight, is a feast needing no spark of fire and is opened with a hide-piercing weapon. The answer is provided by its title, an oyster (ὄστρειον/ostreion)³. Perhaps the oyster was indeed somewhat of an enigma. ¹ Homer: The Iliad. Translation by E.V. Rieu. London, Penguin (1950). ² S. Douglas Olson and Alexander Sens: Matro of Pitane and the Tradition of Epic Poetry in the Fourth Century BCE. American Classical Studies, no 44. Atlanta, Scholars Press/American Pholological Association (1999). ³ P. J. Parsons: «The Oyster». Zeitschrift fürPapyrologie und Epigraphik, 1977, 24, 1-12.